After a brief appearance by “The Nun” in James Wan’s “The Conjuring 2” (2016), this is a franchise spinoff, a supernatural prequel, set decades before the evil spook began to haunt Connecticut’s ghost-hunter Lorraine Warren (Vera Farmiga). After a nun commits suicide at a cloistered abbey in Biertan, Romania, in 1952, Father Anthony Burke (Demian Bichir) is summoned to Rome. 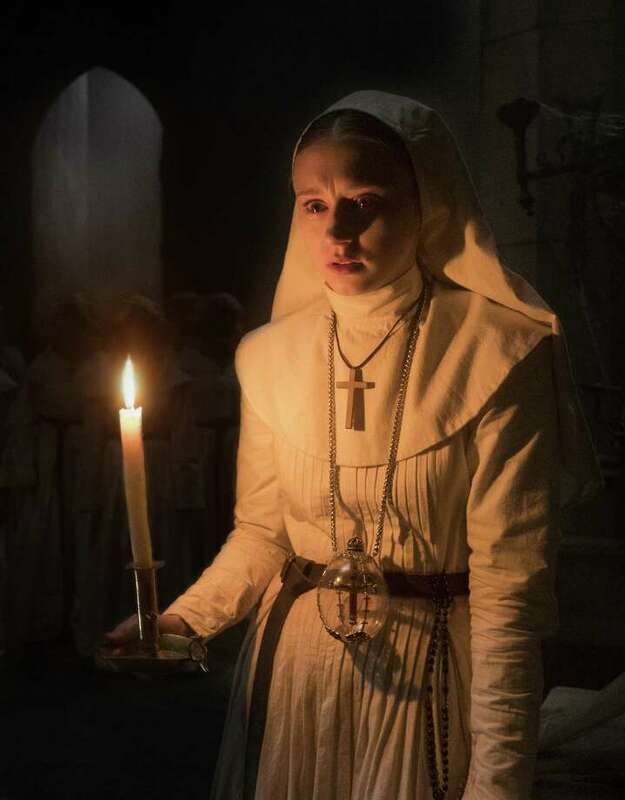 He’s dispatched by the hierarchy of the Catholic Church to investigate the sacred sanctuary, accompanied by a young novitiate, Sister Irene (Vera’s real-life sister, Taissa Farmiga), who has occult visions. “I have orders from the Vatican to determine if the grounds are still holy,” he explains. Taking a horse-drawn buggy to the dark, dank Abbey of St. Carta, a bombed-out medieval castle that is shunned by the superstitious villagers, they’re joined by Frenchie (Jonas Bloquet), the French-Canadian fellow who discovered the gruesome corpse while delivering supplies to the abbey. Apparently, two nuns confronted a demonic presence in a forbidden corner of the ancient building, an apparent portal to hell, where a sign proclaims: “God Ends Here.” One nun is consumed by darkness, while the other hangs herself, still clutching a mysterious key. The skeletal Abbess, whose face remains hidden behind a dark veil, isn’t much help, nor are the other screaming, terrified nuns, some of whom are set on fire, jangling their rosary beads in a prayer marathon. Written by Gary Dauberman (“Annabelle” franchise) and directed by Corin Hardy (“The Hallow”), it’s decidedly mediocre, relying on ominous maneuvers like old-fashioned jump scares, crosses swiveling upside-down, radios that turn themselves on and off, writhing serpents and menacing shadows. Not surprisingly, actress Bonnie Aarons is malevolently memorable as the titular, villainous Valak, who is determined to escape. On the Granger Movie Gauge of 1 to 10, “The Nun” is a derivative 3, proving even bad horror movies conjure big box office.